Fuchs’ Dystrophy causes the endothelial cells (inner most cells of cornea) to start dying off. These cells are responsible for pumping fluid out of the eye. When the endothelium cells stop working, the corneal fills up with water, swells and causes blurry vision. Extreme complications include blisters on the cornea that may eventually break and cause eye pain. Fuchs’ Dystrophy affects 1% of the population and is hereditary. If either parent has the condition, their children have a 50% chance of developing the condition. If diagnosed early, Fuchs’ Dystrophy can be treated effectively with sodium chloride eye drops. In some cases increased intraocular pressure can worsen symptoms, in which case drops to reduce the pressure in the eyes may be prescribed as well. 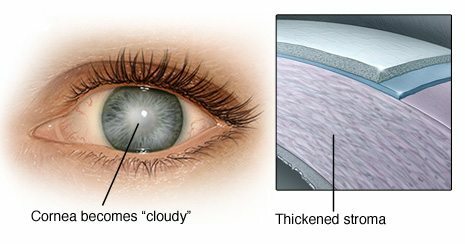 As the disease progresses, if damage continues to the cornea a corneal transplant may be required or alternative treatments such as DSEK (Descemet stripping endothelial keratoplasty) may be an option. Eye Physicians of Northampton is pleased to have two ophthalmologist on staff that specialize in corneal diseases like Fuchs’ Dystrophy. Dr. Raymond Hubbe and Dr. Lauren Shatz are both board certified ophthalmologists with fellowships in corneal disease and surgery. To schedule a consult with one of our corneal specialists, please contact the office directly.